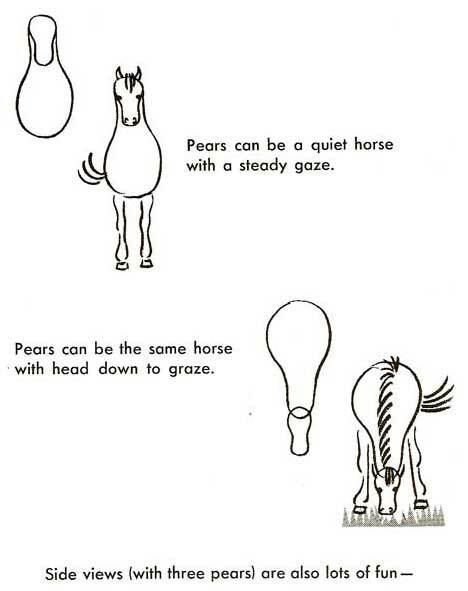 Horses are one of the most popular animals to learn how to draw. They are iconic (which means having big cultural meanings) images of power and independence. For most of us in the United States, the horse reminds us of the days of the wild west and the wide, unclaimed spaces. The techniques you use to draw your horses can evoke those feelings, or inspire different ones. It all depends on your drawing style and your materials. Keep reading to see how to draw more realistic or more emotionally evocative horses. 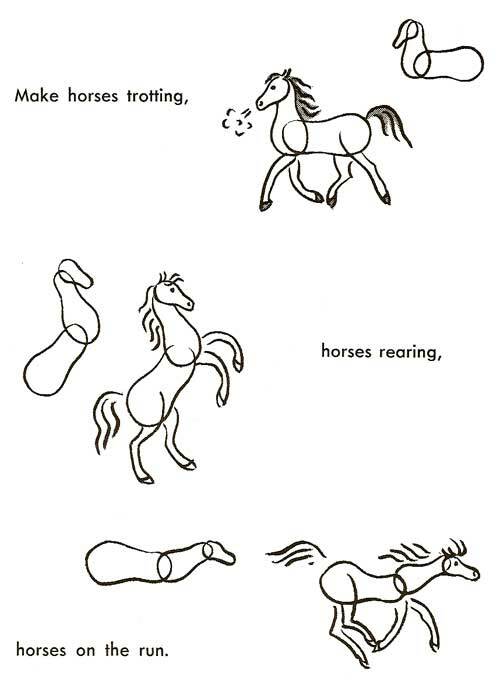 Another way to draw horses. The horses drawn here are an excellent starting place, but they are only a start. To develop your horse-drawing skills, you need to start practicing drawing them in different poses, from different angles of view. In other words, practice drawing horses from the front, and from their side. From the back and even from above. Draw horses grazing and running, lying down and even sleeping. To draw more realistic horses, you will probably need to see horses in person, or at least watch them on TV. Pay close attention to everything they do, like how the position of their ears shows whether they are interested in something or not, to how many of them snooze with one of their back hooves tilted forward, sitting just off the ground. More advanced students should take along an anatomy book that shows horses' bones, and should do a couple of practice drawings of just a horse's bones, without any muscles or fur. It may seem like a dull assignment, but your drawings will be noticeably better afterwards. Now on to techniques and materials. Horses can evoke everything from sleepy, comforting images, to powerful displays of wildness. If you want a calm tone, work with pastels and use curving, blended strokes and mellow colors. For something much more dramatic, pen and ink or charcoal can deliver the rough and powerful textures of horses fighting or acting wild. Instead of using the curved, blended strokes, like you would for a calmer drawing, make your strokes rough and short, with accentuated lines, to show more action and power. Splattered ink can be particularly effective, because it looks like flying dirt.